Welcome to the Freeola Internet customer support pages. 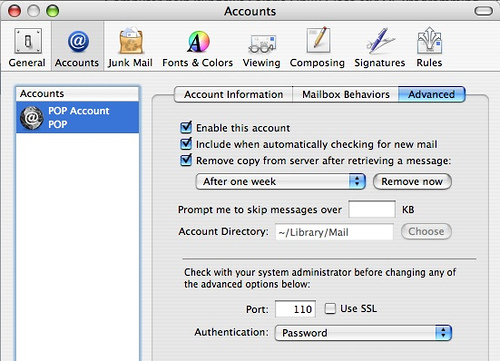 This guide is designed to help with setting your mail client to leave email on the server. For more internet help topics please visit our main Support Page. This article is designed to help you set your mail client to leave a copy of your e-mails on the server so that they can be accessed by more than one computer or mobile device. This is useful if you need to access your mail from multiple computers, however if you do not need this functionality then it is recommended you leave your settings as they are. If you are using EmailPro and wish to access your mail on multiple devices we would strongly recommend changing your mail protocol from POP to IMAP. This can be done easily through your MyFreeola Control Panel. 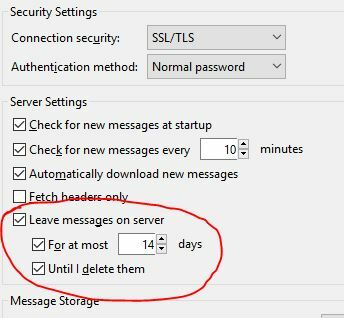 Why do we recommend keeping the messages only for 2 weeks? Since POP3 is not designed to store messages on the server for long periods of time and in large quantities the performance of your e-mail account may be affected if large amounts are stored on the server. We also automatically remove older e-mail stored on our server (up to 60 days old) for the same reason as well as clearing up space on our server for new mail. Make sure the settings are the same on all of the computers from which you will be receiving your mail. If you don’t, one computer will delete the mail from the server before you can receive it at another computer. Click Tools and then Accounts. Select your account and click Properties. Close to the bottom, tick the checkbox Leave a copy of messages on server. Also tick Remove copy from server after and set the value to whenever you wish it to remove old messages (we recommend the maximum of 2 weeks). Click OK to save. Click Tools and then Email Accounts. Select your account and click Change. Click More Settings and then click on the Advanced tab. Click File, Options, and then Advanced. Highlight your current POP3 account and click Change﻿. Choose More Settings and click on Advanced﻿. In the 'Delivery' section, tick the Leave a copy of message on the server box. Click Tools and then Account Settings. 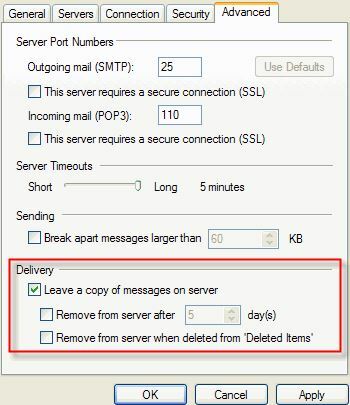 Select Server Settings under your e-mail address. You may need to expand the menu by clicking '>' next to the address. Tick the checkbox Leave messages on server. Set For at most to the value of whenever you wish it to remove old messages (we recommend the maximum of 2 weeks). Click OK to save. Click Mail and then Preferences. 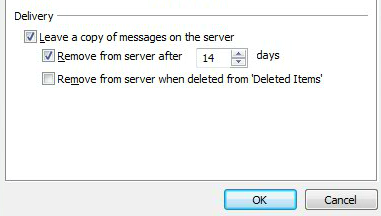 Make sure Remove copy from server after retrieving a message is ticked and After Two Weeks is selected from the drop-down menu. No mention of Outlook newer than 2007. You are correct that nothing is mentioned for that particular version of the software. While we try to keep all guides up-to-date as newer mail clients are released, occasionally some can be forgotten. I have now added a section for Outlook 2010 to this guide, should you still require assistance. I cant get me head round all this.Just want to send and recieve Emails.Thanks. This guide is intended to guide readers through making an advanced change to their mail clients.